Founded in 1911, Devil's Lake is the third oldest state park in Wisconsin, the largest, and the most visited. Devil's Lake offers magnificent views from 500-foot quartzite bluffs overlooking a 360-acre lake. The John Michael Kohler Arts Center presents contemporary American art with emphasis on craft-related forms, folk traditions, new genres, and the work of self-taught artists. The Chequamegon National Forest covers about 858,400 acres in Ashland, Bayfield, Sawyer, Price, Taylor and Vilas counties. 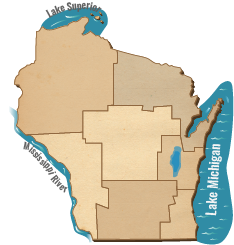 We have so much to tell you about travel in Wisconsin, the question is "Where to start?" We've assembled some ideas to give you a start on selecting a topic that you can make your own with a customized story angle. Whether it's pitching story ideas to national media outlets, developing press trips for travel writers or working with business reporters on a news story, see how our efforts have resulted in media coverage for Wisconsin's tourism industry.